We crossed pass in mid of OCT on the way to Hunza, Karimabad. View was totally different from Summer when it is covered with green and flower, but another beauty with snow. 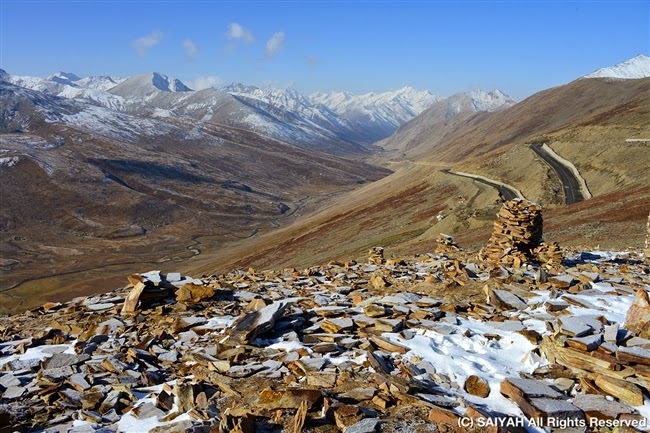 On the top of Babusar pass, there is new sign board and is written as…. Babusar pass connects Gilgit with Kaghan via Chilas during summers. From Babusar top looking north in the distance is Rakaposhi, while on the Kaghan side the polo ground where an annual event is held is visible. The near peaks surrounding the pass include Malika Parbat and Toshe Ri 1 (Sarwali Peak). In 1890 the British built this new, shorter track across Babusar, directly connecting Gilgit and British India. Before this, the only route to Gilgit had been the difficult track from Srinagar over the Burzil Pass and followed the Astore river gorge. The Babusar road was the main route from Rawalpindi to Gilgit from 1947 until 1978 when the KKH was opened. From there, it takes almost an hour to the KKH, near Chilas, and then on to Raikot from where one could take the track to Fairy Meadows and camp for superb views of Nanga Parbat. Further along the KKH one could turn right on the Astore road to travel through Astore Valley, Deosai and Skardu, or continue on the KKH and on to Gilgit. During my recent visit to Swat Valley I found a sheep with unique & beautiful tail. The tail, pretty curious... half of the hind legs and tail are white, and dyed with henna. This sheep is male, sheep around is all female. Sheep who mowed the hair, only the tip hair had been left. ... Though it is winter now. Long tail, short tail, big buttocks sheep ... various types of sheep was walking. Sheep moves in the morning cool time to where there is grass, and rest with shady at noon time, then continue to move in the evening.